You guys as I tell you about these epic muffins there is an entirely different banana bread recipe baking in my oven, right this minute! It’s fair to say we are not balanced in our coverage of awesome banana related recipes, but so far, there have been no complaints, because we only post the very best ones! These are my Mother and Father in-law’s number one favorite from the genius kitchen of Tyler Florence. They have SERIOUS banana flavor because of the method of pureeing some of the banana’s and leaving the rest in chunks that combined with the pecans make for an amazing texture. The recipe is for a banana bread, but muffins are easier for my family so we often go that route. If you choose to make the bread just bake until doneness about an hour and 10 minutes which makes for beautifully caramelized edges. You will love them! Preheat oven to 350 and line or spray a standard muffin pan. In a large bowl, combine the flour, baking soda, and salt, set aside. Mash 2 of the bananas with a fork in a small bowl so they still have a bit of texture. With an electric mixer fitted with a wire whisk, whip the remaining bananas and sugar together for a good 3 minutes; you want a light and fluffy banana cream. Add the melted butter, eggs, and vanilla; beat well and scrape down sides of the bowl. Mix in the dry ingredients just until incorporated; no need to overly blend. Fold in the nuts and the mashed bananas with a rubber spatula. Pour the batter into the prepared muffin tin filling 3/4 the way or into your loaf pan. Bake for about 20-25 minutes for muffins an hour and 10-15 for loaf – until golden brown and a toothpick inserted into the center of the loaf comes out clean. Rotate a time or two for even browning. Cool the muffins in pan for 10 minutes or so, then turn out onto a wire rack to cool completely before slicing. If you make the bread, Tyler recommends you toast it and dust with confectioners sugar for a special treat. French Macaroons have eluded me for years. I enjoy these lovely little cookies, but they are a challenge to perfect because there is that tricky step where you need to make your meringue not too deflated, but just deflated enough, there’s an art to it that I haven’t quite figured out. But these, although not perfect, were so delicious I just had to share them. They are not going to be on the cover of a magazine, but I felt they were cute enough, and as usual, my readers will probably do even better than me in making them get that smooth dome and perfect little ridge of lift that every macaroon needs to be tip top. In the flavor department they were a knockout. I love using buttercream in the center, and peanut butter with the vanilla cookie was such a magical treat. I made a few with other fillings, but this was by far my favorite. 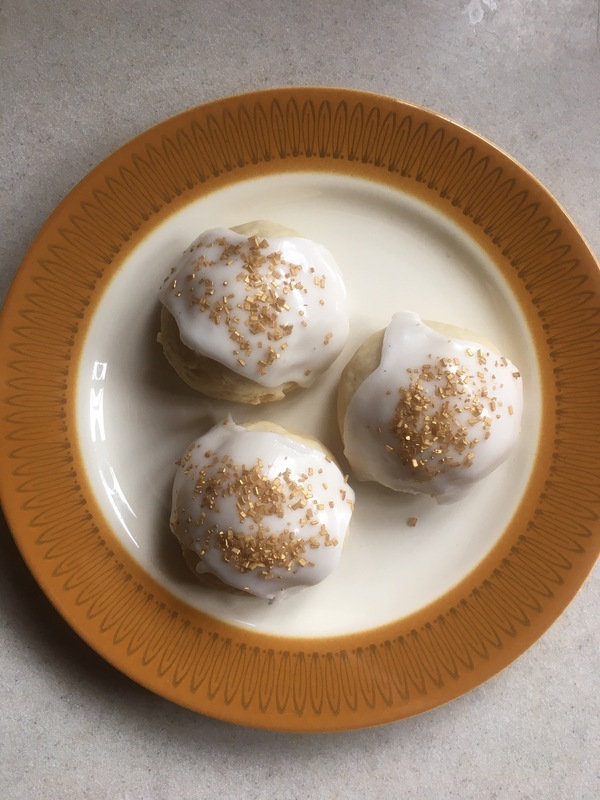 This is a super versatile macaroon recipe so fill them with whatever sounds good to you – the peanut butter frosting I used is below for your reference. To make the macaroons: Process the almond flour and the confectioners’ sugar in a food processor for 20-30 seconds. Sift to remove any large pieces and to aerate the mixture. Separate the eggs and put the whites in the bowl you’ll use to whip them. Don’t start whipping yet, but add a pinch each of salt and cream of tartar. Combine the water and granulated sugar in a small saucepan. Stir over medium heat until the sugar dissolves, then bring to a rapid boil. Boil for 2 minutes; the temperature of the syrup should reach between 235°F and 240°F. Take the syrup off the heat. Immediately start whipping the egg whites, using an electric mixer. When they hold a curved peak on the end of the beater, stop, grab the pan of hot syrup, resume beating, and pour the syrup steadily into the whites as you beat. Add the vanilla once the meringue is thick. Continue beating until the meringue is smooth, glossy, and forms soft peaks. Fold in the almond flour/sugar until everything is evenly combined, then start stirring. This will thin the mixture. Stir until the batter runs in ribbons that disappear back into the mass in 10 to 20 seconds. Test frequently, and stop stirring when you reach this point. I think I often stop too soon which gives my cookies too much lift, they should pipe out pretty flat. Use a pastry bag to deposit a generous teaspoon-sized round blob of batter onto a parchment-covered baking sheet. The cookie should flatten out, rather than remain in a tall blob. If it doesn’t spread, stir the batter some more; your goal is a disc-like, fairly flat cookie. Repeat with the remainder of the batter. Since the cookies won’t spread as they bake, you can position them fairly close together. Allow to rest in a dry place with good air circulation (a counter top is fine) until you can gently touch the tops and come away with a clean finger, about 2 hours. Now is a good time to make your frosting (see step 14 below). Towards the end of the resting time, preheat the oven to 275°F. Bake the cookies for 25 to 30 minutes, till firm on the top. Remove them from the oven, and cool completely on sheet. Use a thin spatula to carefully separate them from the parchment or foil. Spread half the cookies with peanut butter frosting, or any combination of fillings your heart desires. Top with the remaining cookies. Yield: 20 to 22 filled cookies. To make the frosting: In a large bowl with an electric mixer, beat the cream cheese and butter until light and fluffy. Gradually add the confectioners’ sugar 1 cup at a time, mixing thoroughly after each addition and scraping down the sides of the bowl often. Continue to beat on medium speed until light and fluffy, 3 to 4 minutes. Add the peanut butter and beat until thoroughly blended. 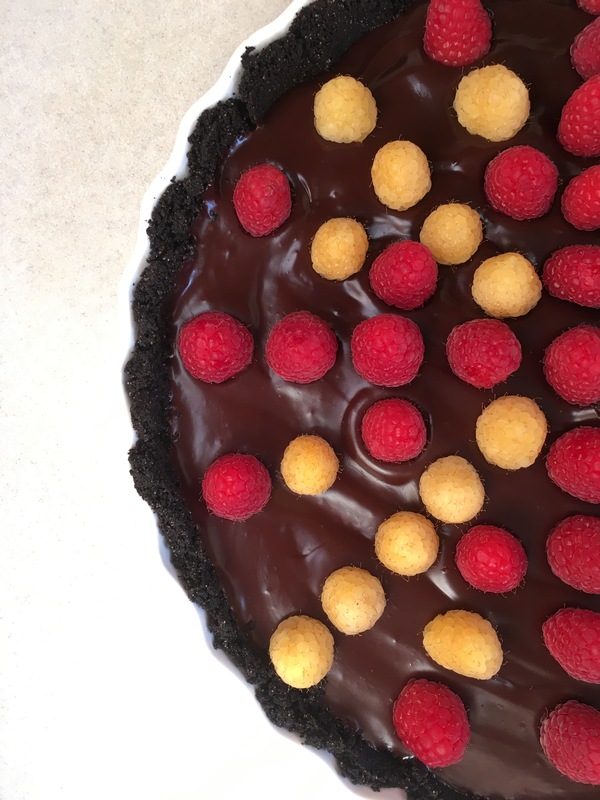 Raspberries and chocolate are totally MFEO, and this dark chocolatey tart is the most simple, elegant, and in all ways delicious way to eat them. I was inspired when I found beautiful golden raspberries and my local market, I wanted to show them off and this super easy tart was the perfect dessert to compliment them. I’m sure you could also use strawberries, blueberries or whatever fresh fruit you’re in the mood for. By the way, I really think the coarse salt makes a difference and it’s easy to find, just a small amount can make a dark chocolate dessert really POP off your palette! Preheat oven to 350. In a food processor, combine the cookies, sugar, 1/2 teaspoon salt. Process until very fine crumbs form. Add butter and pulse until mixture comes together. Press crumbs firmly into a 9 inch fluted tart pan with removable bottom. Place on a baking sheet and bake until crust is dry and set, about 20 minutes. Let cool. In a large bowl combine chocolate and a pinch of salt. In a small saucepan, bring cream to a bare simmer on medium high heat. Immediately pour cream over chocolate and let stand 1 minute, add vanilla. Stir gently until chocolate melts and mixture is completely smooth. pour chocolate into cooled tart shell and refrigerate until set, at least 30 minutes. To serve, remove tart from pan and put raspberries or whatever fruit you’re using on top. The dark, mysterious, beautifully flavored and often misunderstood blackberry is the star of this show. Nice firm and tart Granny Smith apples support the berries so things aren’t one note smooshy or soupy, but that gorgeous dark magenta berry bubbling out the top of these hand pies tastes like all that is right in the world. I used this butter crust recipe, and you know I’m loyal to my shortening, but for a handpie where you’re going to need to handle the dough more and it takes more of a center stage, this dough worked out well, but it is tougher to make and can be harder to work with so feel free to use a shortening dough if that’s what you prefer. You can use other berries too, but this combo made for a sweet and sour flavor explosion of total and complete hand-pie joy! With machine running, add ice water through feed tube in a slow, steady stream, just until dough holds together without being wet or sticky. Do not process more than 30 seconds. Test by squeezing a small amount of dough together; if it is still too crumbly, add a bit more water, 1 tablespoon at a time. To make the filling in a medium bowl, add apples, blackberries, lemon, sugar, cornstarch, cinnamon and cardamom; stir to combine, set aside. Preheat the oven to 425°F. Line two baking sheets with Silpats (a French nonstick baking mat) or parchment paper. On a lightly floured work surface, roll one half of dough into a large rectangle, about 1/8-inch-thick. Using a 5-inch cookie cutter, cut out 6 rounds. Transfer rounds to prepared baking sheet. I used a small bowl and just traced around it with a knife because I don’t have a large cookie cutter – I think mine was just short of 5 inches. Place about 3 or so tablespoons of the apple/berry mixture onto one round – use a slotted spoon and leave any juices in the bowl so you don’t get soupy pies. Lightly brush egg around the edge of each round. Take another dough round and put it on top. Gently press edges together to seal. I then took a fork to the edge for decoration, do what you think looks cool. Brush the tops of each pie with egg. Using a paring knife, slash the top of each pie. Sprinkle generously with raw or demera sugar. Repeat this process with second half of dough and remaining filling on second baking sheet.I was able to make 8 total, but you can use less filling and roll them over into half moons to make more. Bake until golden brown, 20 to 25 minutes. Transfer pies to a wire rack to cool slightly before serving. Or let cool completely, and store in an airtight container at room temperature up to 4 days. In a medium bowl, cream together butter, sugar, eggs, ricotta cheese, and vanilla extract. Combine the flour, baking soda, baking powder, and blend into the creamed mixture, mixing in additional flour as necessary to form a workable dough. You don’t want it too dry, but you need to be able to handle it enough to roll into balls. I ended up wearing gloves and dipping them in flour a number of times just to make things less messy. Roll dough into teaspoon sized balls, I used my cookie scoop. Arrange with a little room to expand on your baking sheet. Bake 9-11 minutes until lightly browned and nicely risen. For the glaze beat milk, confectioners sugar, and almond extract until smooth. Spoon over cookies and before the glaze sets sprinkle with your decorative sugar or sprinkles. If you have loads more than you can eat or feed people over a few days freeze some before you glaze them to eat another time and just glaze them once defrosted. My mom makes the best apricot jam in the world (recipe coming soon, don’t you fret). I always try to get a jar when I visit or have her bring me one (or two or three). So, the other night when we were having an Italian themed family dinner at my house I knew what I had to do. Last fall, I had one of these homemade beauties in Rome and have wanted to make one ever since. I added almond flour to the original recipe and love the little bit of extra “oomph” that it gives. This crostata is simple, summery and oh so heavenly! Place the flour, icing sugar and butter in a food processor with dough blade and pulse until the mixture looks like fine breadcrumbs. Add egg yolks and the icy cold water and process until the mixture forms a smooth dough. Scoop out of the bowl, wrap in cling wrap and let it sit for at 40 minutes in the fridge. Preheat the oven to 350 F and generously grease a 9-inch fluted tart pan with a removable base. Form 1/2 the pastry into a ball and place between 2 sheets of baking paper. Roll out until it is about half a centimeter thick and then line the base and sides with the pastry. The pastry should come about 2 cm up the side of the tin. Spread the jam evenly across the base of the tart. Now roll out the remaining pastry and cut it into strips. Carefully drape the strips over the pastry in a lattice pattern, leaving a nice gap between the strips. The pastry can be a little soft and sticky, so I didn’t weave the strips because the dough was tearing too easily to do that (I didn’t let it sit for 40 minutes in the fridge—only 20 minutes—which is why I changed that in the instructions). Trim any extra bits of pastry from the edges and bake in the oven on the top third rack for 35 – 40 minutes until the pastry is lightly golden (mine took a bit longer than that, but my oven is trippin lately). Cool before serving. In case you haven’t noticed, it’s gotten pretty hot out around these parts. And all I want in the summer is refreshing slushy drinks. My friend made a version of this for me a while back and I have thought about it on every hot day since. This is SO refreshing and so simple to make, it should be a summer staple. It’s even pretty healthy but tastes like dessert, so it’s a winner all around! Blend all ingredients together until you have a slushy shake. Add more or less milk depending on desired consistency. Drink and find a hammock enjoy these magical summer days! Note: This recipe is kind of loosey-goosey. You can adjust any or all of the ingredients, depending on desired consistency and sweetness. Also, it’s important that the grapes and honeydew are frozen or it will be a mushy mess!